Well let me start out saying, I had never made flan before. My son said he loves flan and wanted me to give it a go. 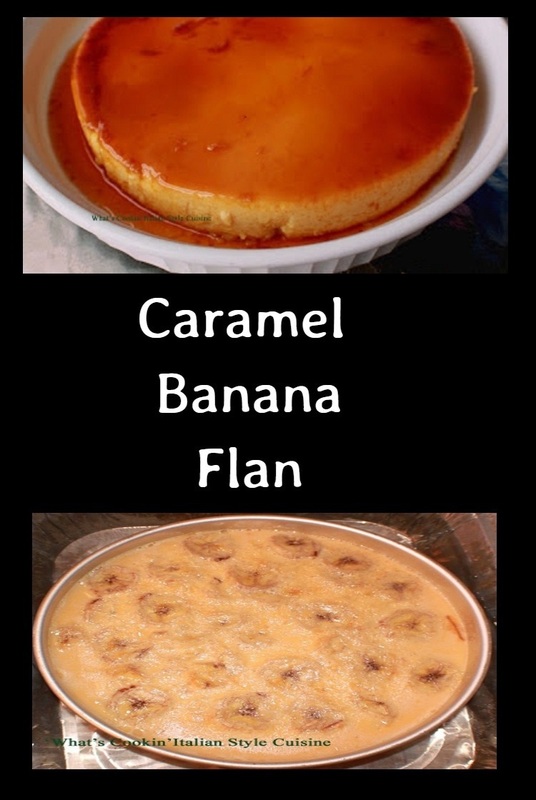 This makes it's own light caramel sauce all in one pan and this caramel banana flan was over the top delicious! New to making flan and my first time! My two sons both agreed to try a banana caramel flan first. I learned alot from Pastry Chef Online and Chef Mireille reading these two totally different flan recipe blogs. They both are wonderfully rich and delicious looking. I love the tips they both shared. So here it goes. I still made some bloopers along the way for the first time but in the end it did come out pretty darn tasty if I do say so myself. I would make this again and again! I will be making the pumpkin flan next just for me! I absolutely love pumpkin! This is just the beginning of many kinds of flans to come. The possibilities are endless. I can think of so many flavors using raspberries, chocolate or and of course coconut! This is the perfect dessert for any ending of a great meal! Have a large deep pan cake pan of cold water ready that you can set the pan your using to make the caramel in ready to place it in after its cooked. Place sugar and water in a covered small pan. Bring to a boil moving the pan back and forth to get all the sugar dissolve. Continue to for 2 minutes. Remove the cover and boil rocking back and forth but not stirring, until it turns a light amber color this takes from start to finish around 20 minutes on low heat. Prepare your pan with slices of bananas and place on the bottom of the pan then pour the caramel on top. That was my blooper I didn't do that! Place the bananas down first in a pan then pour the caramel mixture over bananas I reread it twice and still did it wrong! 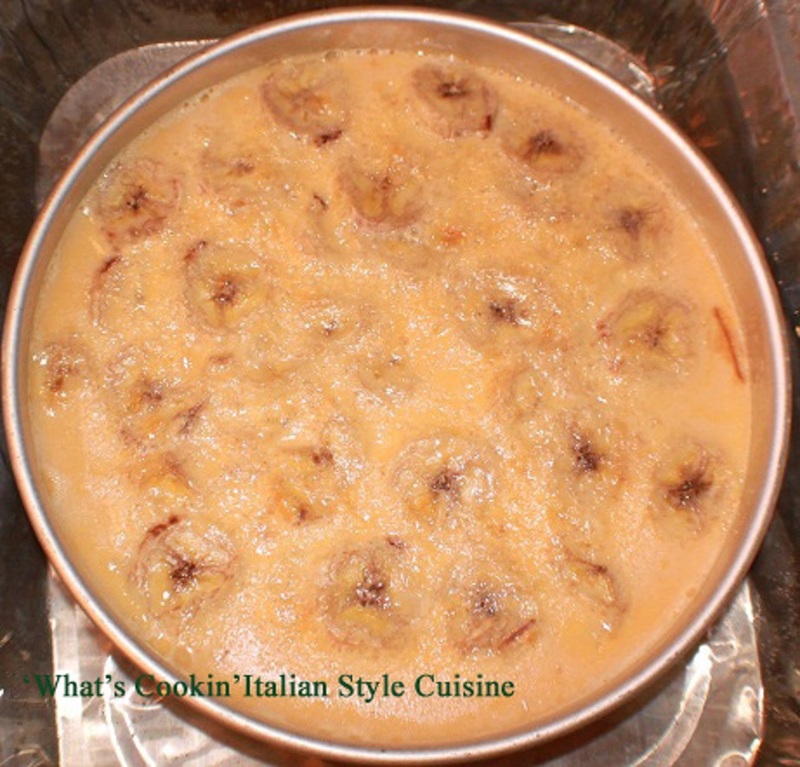 Hence the bananas floated to the top of the flan! Even with the blooper it still tasted great! In a heavy duty bowl using an electric mixer, beat eggs for 10 minutes until light. Add the milks and beat 2 more minutes. Pour over the caramel banana mixture. Set the pan (I used a metal 9x9 round cake pan.) in a roasting pan filled with water half way, this gives the custard a water bath to cook in. Bake at 350 for 55 minutes or until the toothpick comes out clean from the center. Cool at room temperature. Refrigerate overnight or at least 3 hours before serving. Run a sharp knife around the edge and invert onto a deep welled plate to catch the syrup. 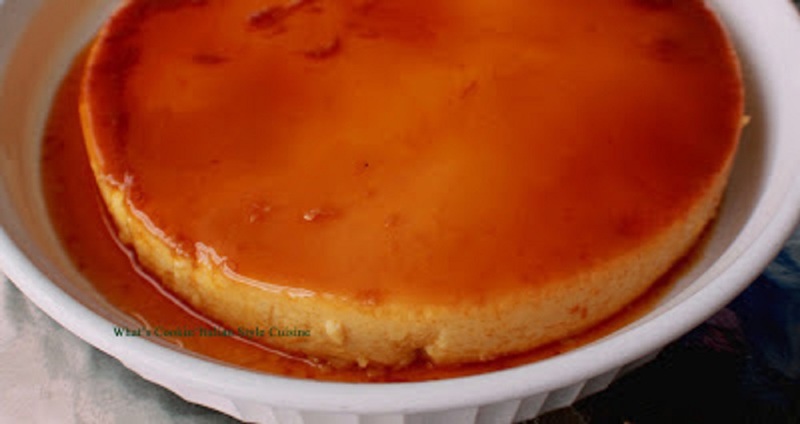 I am now a huge fan of flan! I adapted the Salted Caramel Banana Flan recipe from Chef Mireille, I omitted the salt. Claudia your flan looks perfect! This is my mom's go to dessert, and even though I watched her make it I never have made it myself. Bravo to you!! I've always wanted to try making flan. Looks delicious! I needed a new dessert for entertaining this weekend. If I can get my shopping list right, this is on the menu! The bananas sound wonderful with the caramel! What a marvelous flan!! I've never made flan either, but your first attempt sounds delicious!! Bananas, custard and caramel. YUM! Bananas and caramel are irresistible together - this sounds amazing! So glad you and your sons enjoyed it! I love caramel bananas, but I haven't had them in a plan before. A great Easter dessert. I love how simple you have made this ...great share. I am looking forward to the pumpkin one, too. How adventurous you are! I'm not sure I'm ready to attempt flan yet. There are some recipes I'm ready to jump into ... and others intimidate me. Flan intimidates me. I love how simple you make it seem...maybe I'll try.